In 2016, the presidential race was dicey. We wanted to do our part to ensure that the progressive values we hold could remain intact. We decided that meant a campaign to Stop Trump. 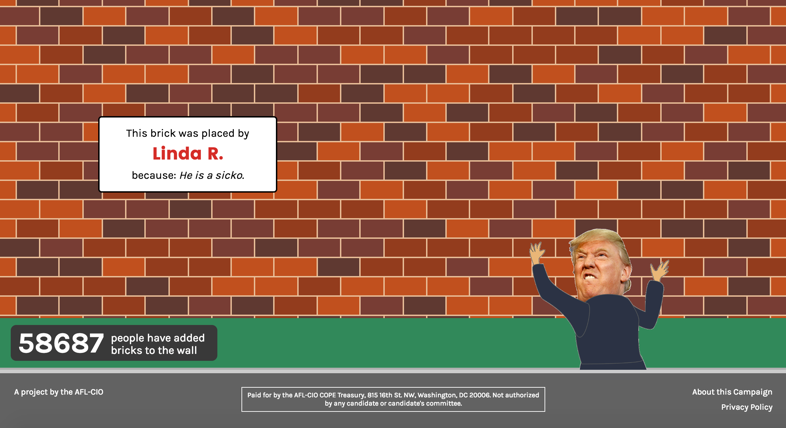 We had an idea to create a website that would build a “virtual” wall, allowing folks to add a brick and a reason as to why they weren’t voting for Trump. 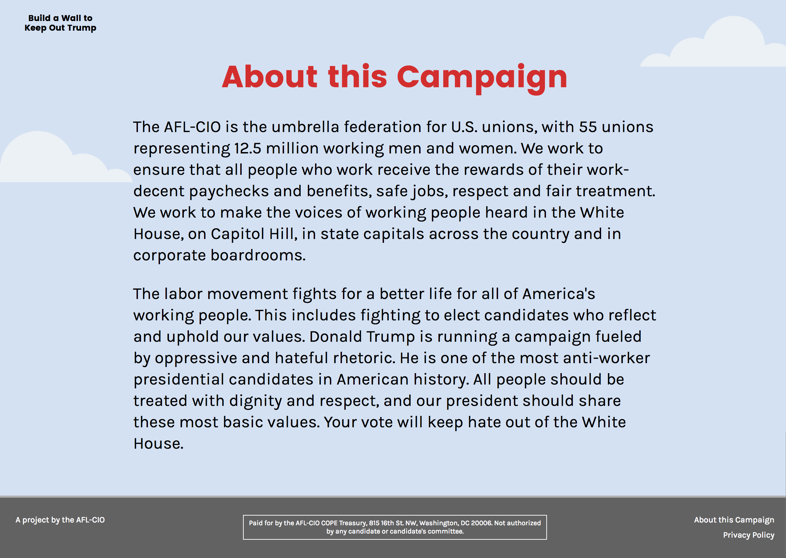 We pitched this idea to the AFL-CIO as a list-building and visibility campaign, helping them reach newer audiences while engaging their current audience base. 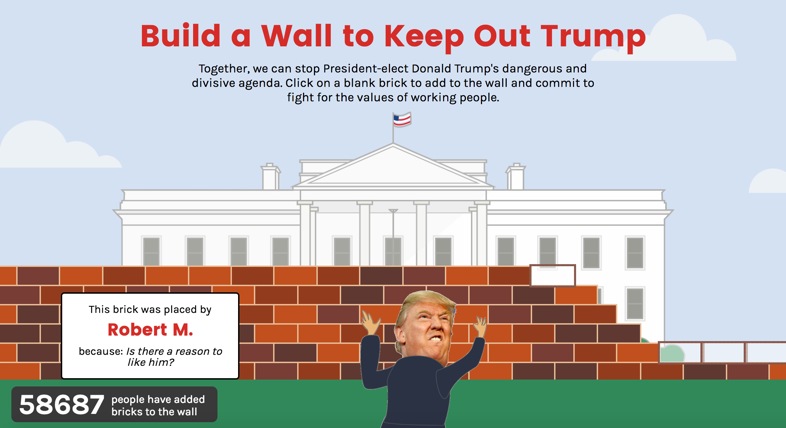 The Stop Trump campaign needed to be interactive, fun, but also have a very clear message. 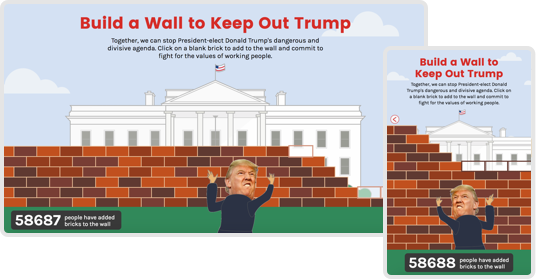 It was important to keep the text as short as possible, and letting the visual and interactive aspect – the brick wall and the ability to add bricks – stand out the most. 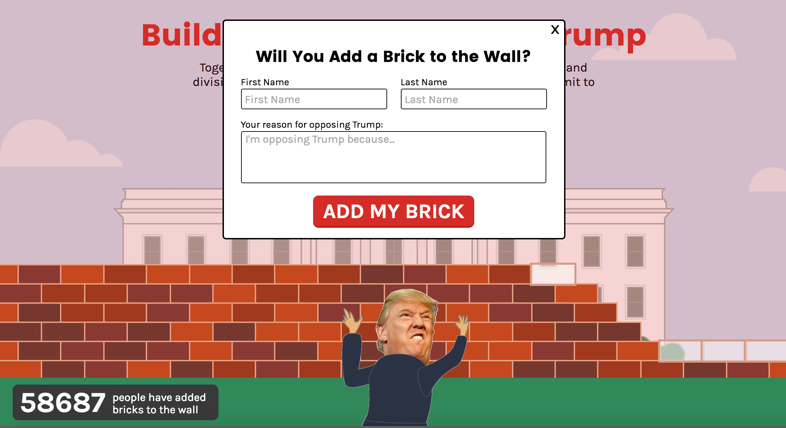 We also wanted to give people some ownership of the bricks, so gave them the ability to select a color for their brick and write a reason of why they weren’t voting for Trump. It was important for the website to be dynamic and able to handle a potentially large number of bricks. For this campaign, it was important to reach as many people as possible, thus developed an extensive data science and A/B testing plan to ensure we were continuously using the most effective language and experience and ran social media ads. We launched the website 2 weeks before election day. Throughout these 2 weeks, we conducted extensive A/B testing, testing out such things as language, background image, layout, and prompts. Overall, the site attracted a substantial number of visitors and engagement was quite high. On average, 80% of visitors clicked on an empty brick, and 40% of all visitors added a brick to the wall. There were over 55,000 bricks added (making for a pretty tall wall! ), and the site succeeded in adding over 25,000 new members to the AFL-CIO list.